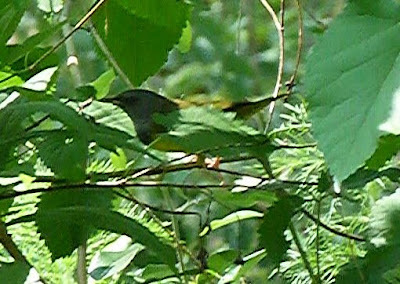 American Redstart - Gill yard, Franklin Co. MA. April 28th, 2011. 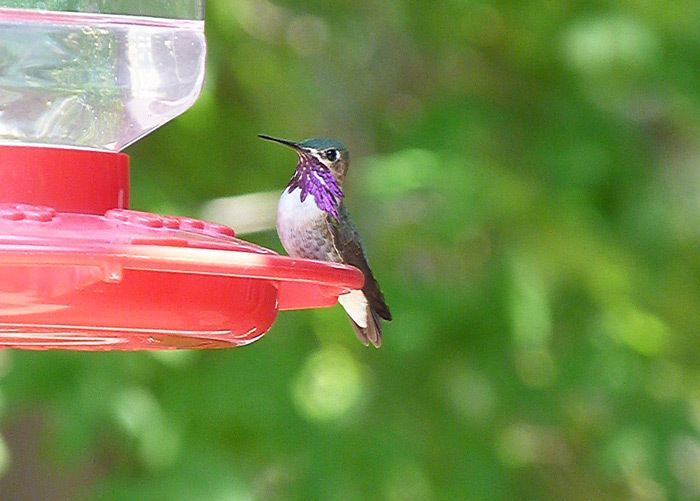 Warm, wet southerlies continue bringing many new birds to our yard and immediate surroundings. Most obvious today were Ovenbirds (9), Blackburnian Warblers (3), Wood Thrushes (3), American Redstart (male), and a Ruby-throated Hummingbird at the feeders - all of which were new for the year. Notably, after a small incursion of about 30 birds in our yard yesterday, Dark-eyed Juncos seemed to have moved out altogether though most of the 20 or so White-throated Sparrows remain. 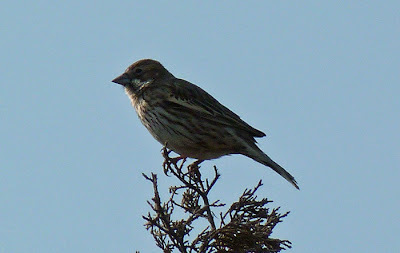 Purple Finches appear to be everywhere at the moment with singing birds all over Gill and at Barton Cove. 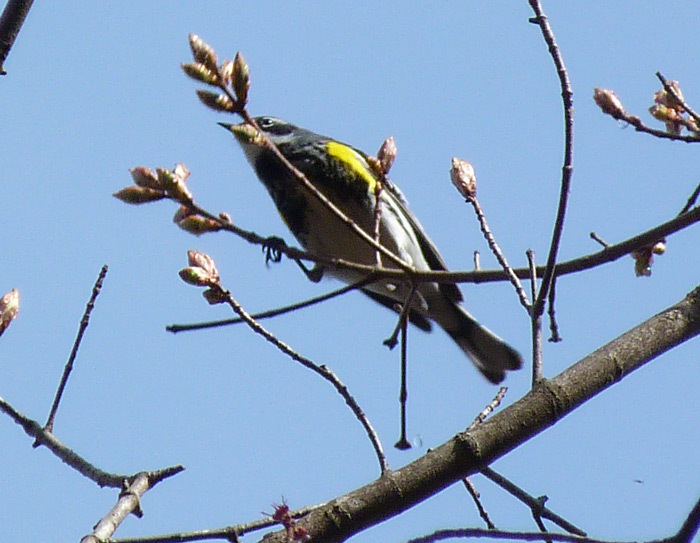 There was also a major movement of Yellow-rumped Warblers today, notably through our yard and also at Barton Cove this morning. 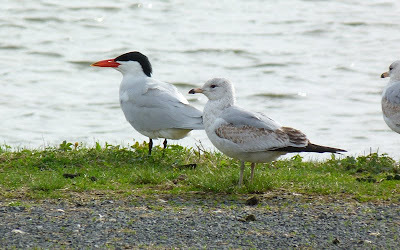 A few Northern Parulas and Yellow Warblers have also been with these flocks. 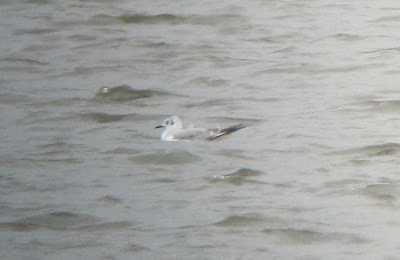 After an afternoon of squally, thundery showers I called at Barton Cove late in the day to check for new arrivals. 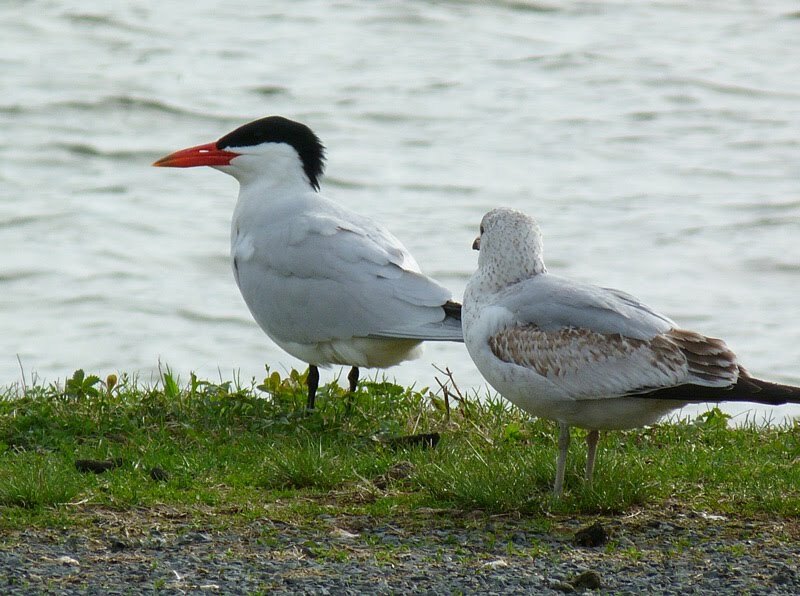 To my delight, three first-cycle Bonaparte's Gulls sat on the water just off Riverview Drive in Gill and a cursory scan of the Ring-billed Gulls resting at the public ramp (just off Rt 2 in Gill) produced the Caspian Tern - I was a tad surprised to find it resting on the shore. 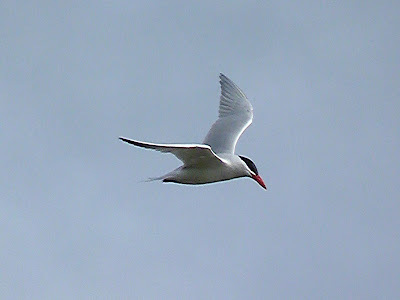 It gave exquisite views, both at rest and in flight. Another Common Loon had dropped in to join the two in the Cove from this morning, and a Gray Catbird called from the brambles close to the Emu pens by the boat ramp. 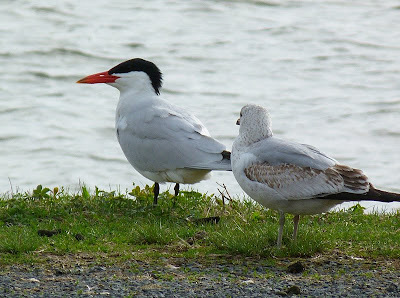 Caspian Tern - Barton Cove, Gill, Franklin Co. MA. April 28th, 2011. Heavily cropped distant record shots taken with Panasonic Lumix FZ40. Uncommon spring migrant in MA and my first in the Pioneer Valley. Bird spent most of its time 'quartering' over the cove surprisingly high above the water. The balmy South-easterlies, now in their third straight day, brought a plethora of migrants to Gill today including this Caspian Tern quartering high above Barton Cove this morning. 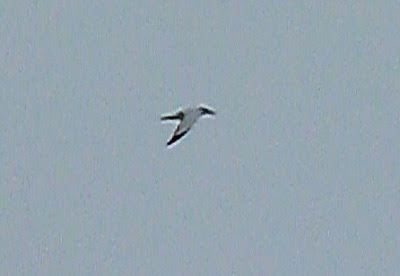 The bird remained well above tree top height for most of the fifteen minutes that I watched it. Also present, a Bonaparte's Gull and two Common Loons as well as three marauding Bald Eagles. The air was heavy with sounds of singing warblers this morning, despite some rain. 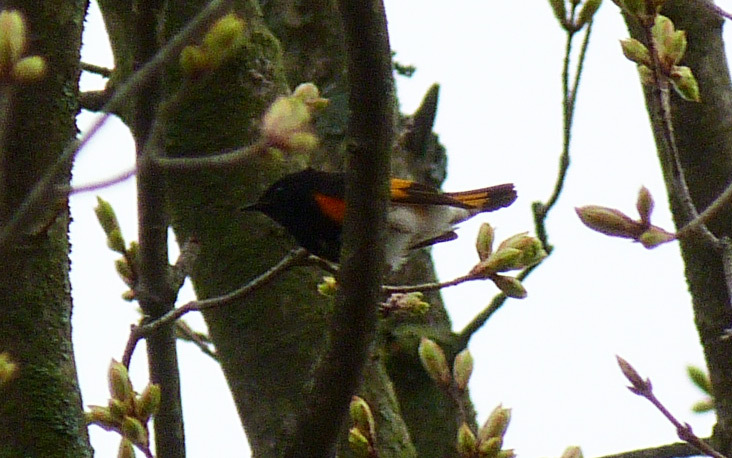 More year firsts appeared including Chimney Swifts (Barton Cove), 9 Ovenbirds, 3 Wood Thrushes, 2 Blackburnian Warblers and an American Redstart. Hopefully, I'll have a more complete post on the migrant surge over the last three days - it's been quite amazing! Calliope Hummingbird - male, Lost Maples State Park, Bandera Co., TX. April 15th, 2011. Beautiful bird coming into the feeders with Black-chinned and Ruby-throated Hummingbirds. Seen by the restrooms right at the main entrance to Lost Maples. 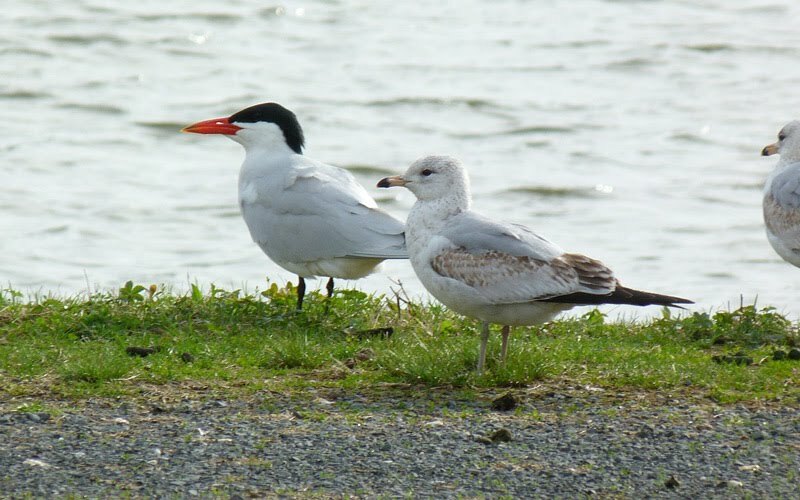 This year's Texas tour with Birdfinders produced three new additions to our tour loop list, no small achievement considering the tour has run every year since 1995! The additions were all complete surprises ( I like surprises!) since the timing of our trip tends to miss the potential for lingering wintering species (such as the Lark Bunting) and goes out a bit too early for the later passage warblers (such as the Mourning Warbler at Sabine Woods). 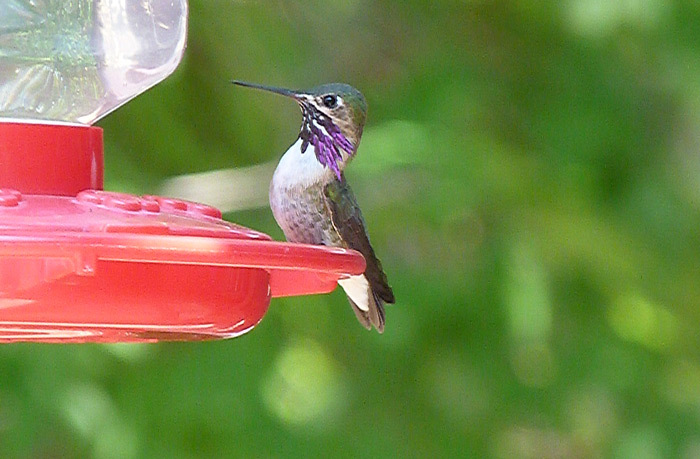 The highlight was a dazzling male Calliope Hummingbird, a species which we most frequently encounter on our Arizona and Colorado/Wyoming trips. 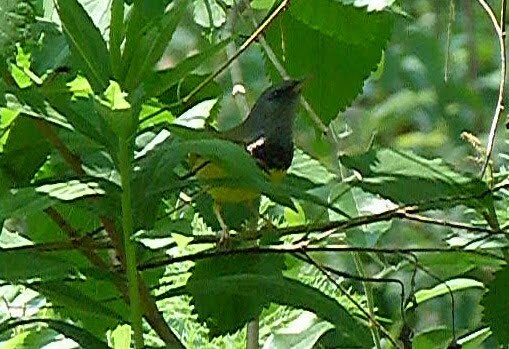 This bird simply wasn't on the 'radar' for a spring tour to Texas. 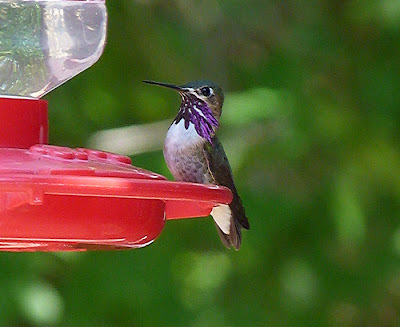 Calliope Hummingbird - male, Lost Maples State Park, Bandera Co., TX. April 15th, 2011. 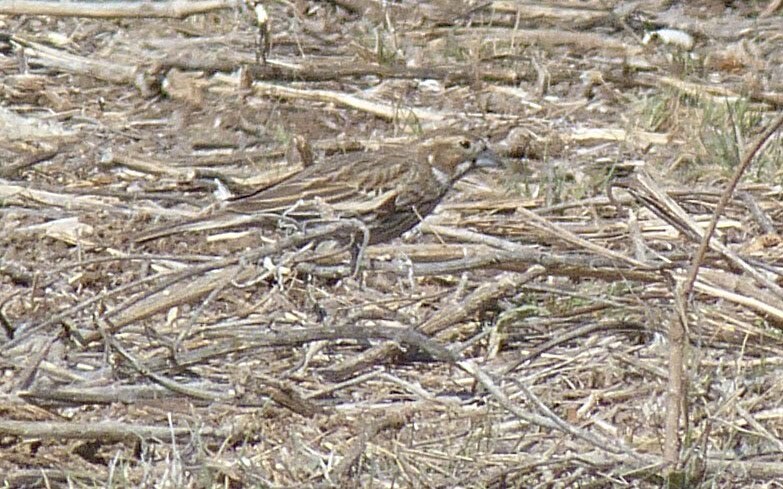 Lark Bunting - Neal's Lodges, Uvalde Co., TX. April 16th, 2011. 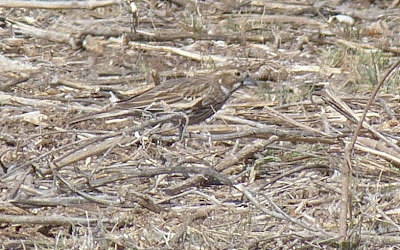 Found by the cattle troughs along the bird trail at Neal's Lodges and hanging out with Lark, Vesper, Clay-colored and Chipping Sparrows. 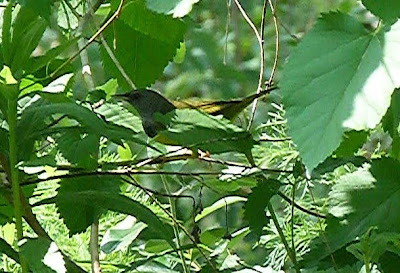 Mourning Warbler - male, Sabine Woods, Jefferson Co., TX. April 18th, 2011. Another unexpected find and something of a skulker as might have been expected. We were astonished to find out a little later that a male MacGillivray's Warbler had been photographed at the drinking pool in Sabine Woods roughly around the same time that we were watching this bird! 04/25 - In addition to the Louisiana Waterthrush photographed today, Northern Waterthrush, Chestnut-sided Warbler and Yellow Warbler were new, though Susannah reported hearing a Yellow Warbler somewhere in Gill yesterday. Yellow-bellied Sapsuckers have been drumming on Derby Hill on 23rd and today (2+), with a Hermit Thrush and a Black-throated Green Warbler there today as well. 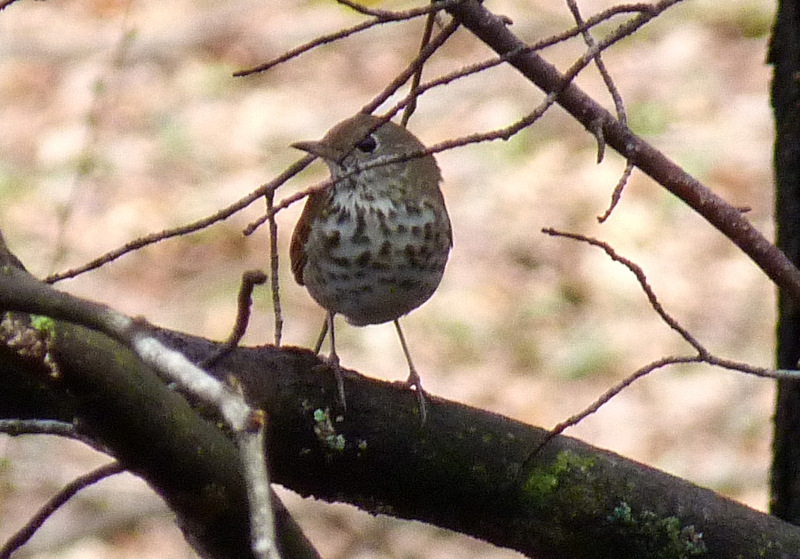 Brown Thrasher in the yard. In the evening, an American Woodcock displaying and a pair of Barred Owls 'caterwauling' from the woods - sounded incredibly eerie on such a damp, foggy night. Yellow-rumped Warbler - male, Gill yard, Franklin Co. April 24th, 2011. 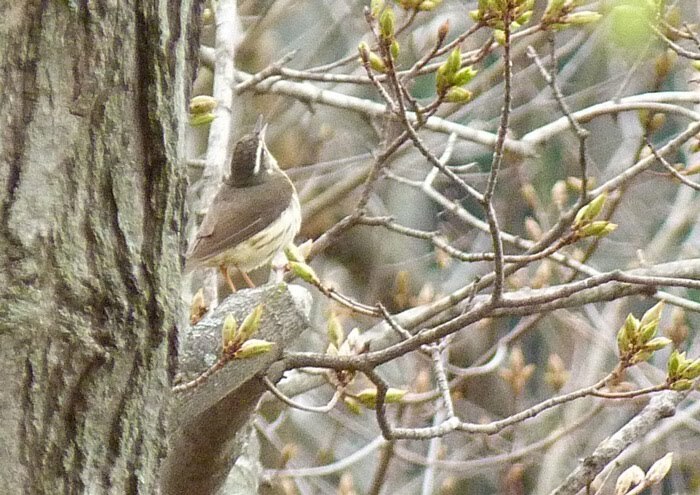 04/24 - Brown Thrasher and Hermit Thrush in the yard and a light 'wave' of Yellow-rumped Warblers. 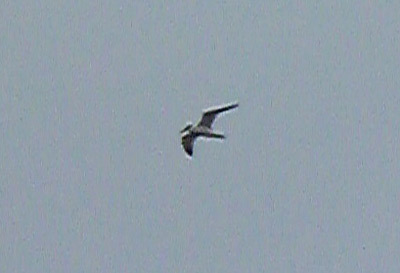 Three soaring Broad-winged Hawks and a Sharp-shinned Hawk may have been migrants. Six Purple Finches arrived at the feeders. Hermit Thrush - Gill yard, Franklin Co. April 24th, 2011. 04/23 - Bedraggled Northern Flicker in the yard and about an inch of fresh snow in the surroundings - yuk! 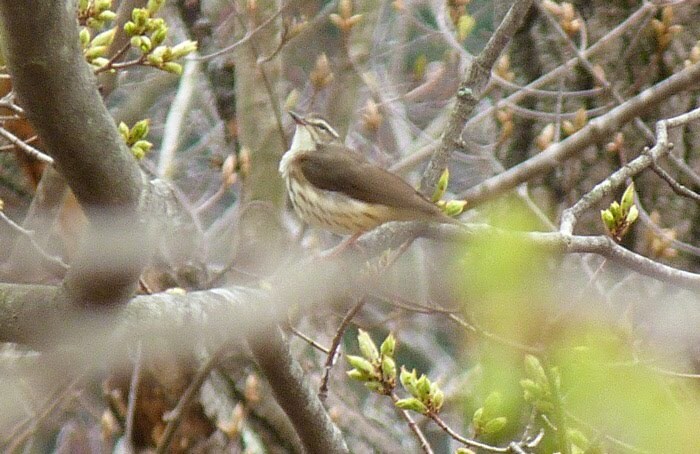 Louisiana Waterthrush still singing through the snow showers. 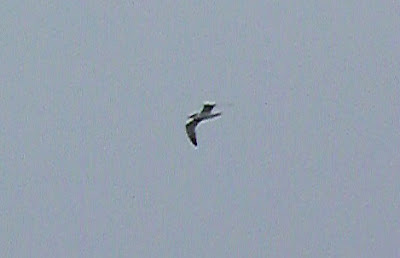 American Kestrel and about five Tree Swallows appeared late in the afternoon as the snow turned to drizzle and light rain. 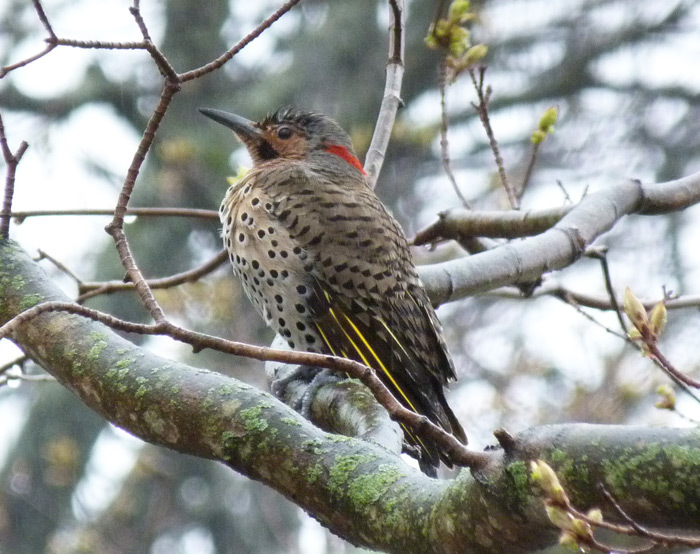 Northern Flicker - bedraggled and sitting out the rain, Gill yard, Franklin Co. April 23rd, 2011. 04/22 - Five Palm Warblers under the feeders in the morning but not there after. All appeared to be yellow 'Eastern' birds, plus a singing Pine Warbler. A calling Broad-winged Hawk and an American Woodcock displaying on our neighbor's property just up the road. Daily fare includes Red-tailed Hawk, Mourning Dove, Eastern Bluebird, Ruby-crowned Kinglet (3+), American Goldfinch (15+) Pine Siskin (6+), White-throated Sparrow (20+), Song Sparrow (10+), Chipping Sparrow, Dark-eyed Junco (10+), Red-winged Blackbirds and Brown-headed Cowbirds. 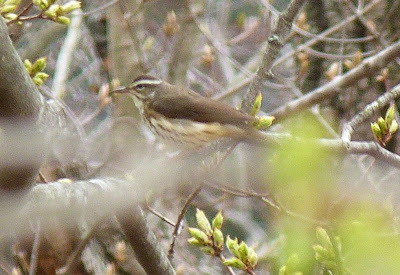 Louisiana Waterthrush - Gill yard, Franklin Co. MA. April 25th, 2011. Singing male, present since April 17th. This is such a fantastic time of year in Western Massachusetts. 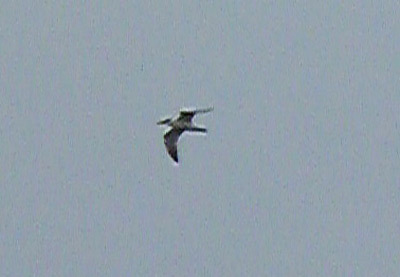 Even if winter does its best to whip back as it did on Saturday, each and every day brings newly arrived migrant birds. 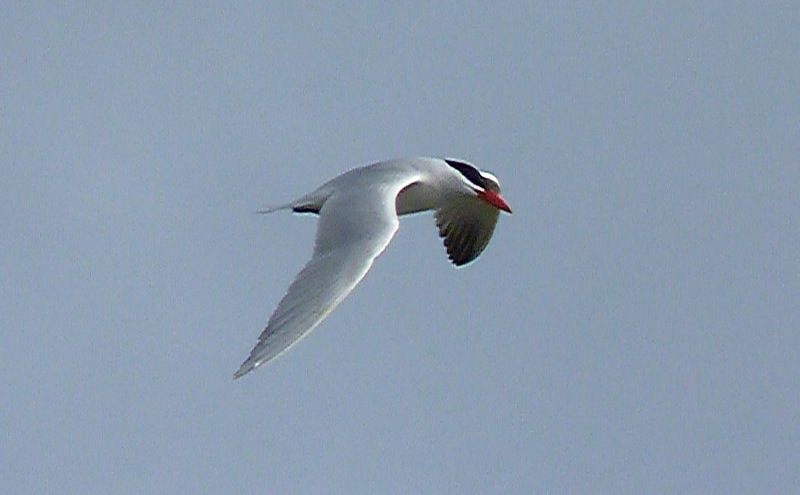 Some are keen to settle down and get on with the breeding cycle, whilst others are simply passing through on their way North. Either way, the promise of new arrivals sees me working with windows open in the office, and regularly checking the feeders. 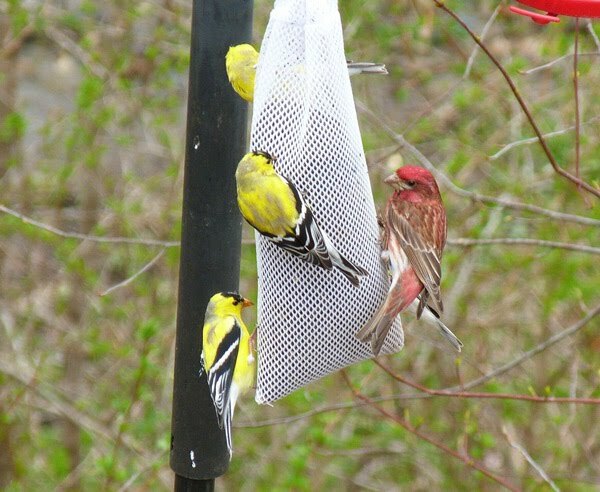 Only yesterday (04/24), six Purple Finches arrived seemingly from nowhere and descended on the thistle feeders. 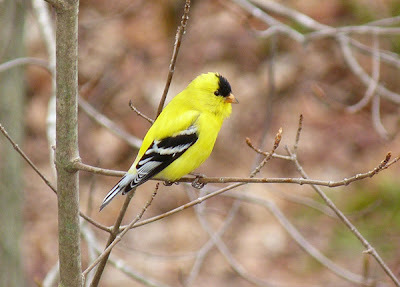 Together with resplendent summer plumaged American Goldfinches they provided a 'riot' of color. American Goldfinches and Purple Finch (male) - Gill yard, Franklin Co. MA. April 25th, 2011. The real star, for my money at least, has been a territorial Louisiana Waterthrush on the brook running through our yard. Susannah actually first heard him on April 17th whilst I was still in Texas, and today it was singing right outside my office window from song posts surprisingly high above the water. 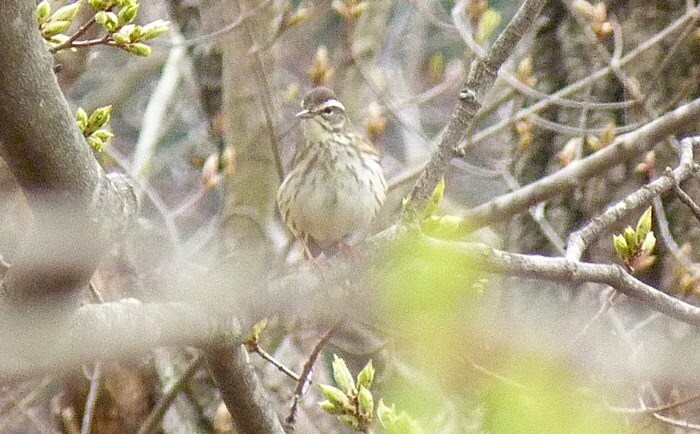 Described as an "Uncommon and local breeder" in the "Birds of Massachusetts" by Veit and Petersen, we are surely fortunate to have this beauty holding territory in our yard.